Is International Investing Still Worthwhile? As I look at the returns for global stock asset classes so far this year (through 3/20), a I see a familiar result: US stocks are again at the top of the heap. The DFA US Large Company Fund (DFUSX) is +13.2%, the DFA International Large Company Fund (DFALX) is +11.8%, and the DFA Emerging Markets Fund (DFEMX) is +9.4%. These relative relationships hold even as we look out over the last 10 years. Those funds’ annualized returns through February are +16.6%, +9.6%, and +10.5%, respectively. This brings up the obvious question: Is international investing still worthwhile? Based on the last 10 years, the answer is certainly “no.” But the recent decade masks the more reliable results from prior years where international stocks had much better relative returns and the right international asset classes provided meaningful diversification to a US portfolio. If we look at the period from 1970 (the inception of the MSCI World ex USA Index) through February 2009 (prior to the last 10 years), we find that international stocks had a slightly higher return than US shares over the entire period. The MSCI World ex USA Index returned +9.1% per year compared to +8.9% for the S&P 500. A 70/30 mix of the S&P 500 and MSCI World ex USA Index, rebalanced annually, earned a +9.2% return, higher than either index by itself, with a level of volatility that was less than either index alone. Clearly, the dominance of US stocks is a recent phenomenon. US and international stocks go in and out of favor so you should be very cautious to extrapolate recent trends into the distant future. The story for foreign stock diversification improves further if we look beyond the large-cap growth companies that dominate basic indexes. Smaller and more value-oriented stocks have generated much higher returns than basic market indexes in non-US markets, just as they have domestically. Adding international small-cap and value stocks to a portfolio has further improved historical returns and portfolio efficiency, even compared to US-only small-cap and value tilted allocations. Over the longest period available for all data, from 1970 to January 2019, the S&P 500 returned +10.4% per year with annualized volatility of 15.1%. Diversifying domestically improves on that result — the DFA Domestic Balanced Strategy Index is 33% S&P 500, 33% US large value, 17% US small cap, and 17% US small value. This more diversified allocation had over 2% per year higher returns (+12.5%) with only a mild uptick in risk (annualized standard deviation was 16.4%). 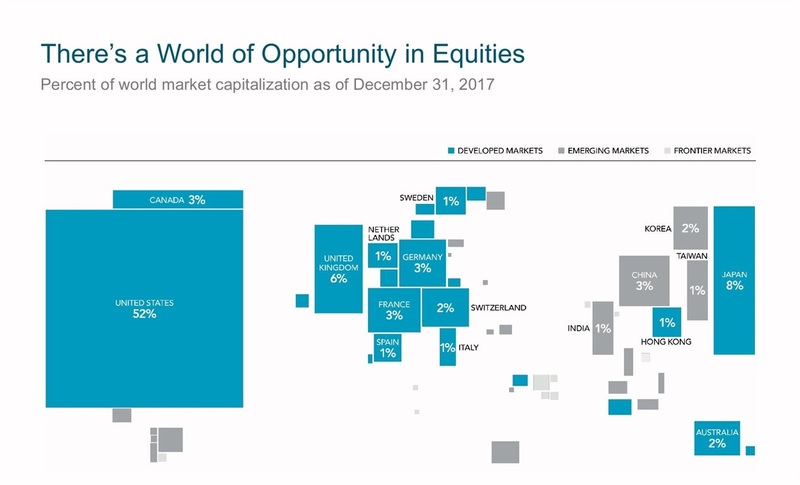 The DFA (Global) Equity Balanced Strategy Index adds 10% in REITs and 30% in non-US stocks to the domestic version: 10% in international large value, 5% in international small cap, 5% in international small value, 3% in emerging markets large cap, 3% in emerging markets value, and 4% in emerging markets small-cap indexes. The added diversification results in a portfolio that has been no more volatile than the S&P 500 (annualized standard deviation of 15.2%) but with a higher return than either domestic index: +13.3% per year. Over the longest period available, a globally diversified, small/value tilted portfolio has resulted in higher returns without experiencing greater volatility when compared to US-only portfolios. International diversification doesn’t just work in the long run, either. We’ve seen more than one decade since 1970 when US stocks produced lackluster returns. In each period, diversifying across the US market helped, but globally diversification was even more beneficial. 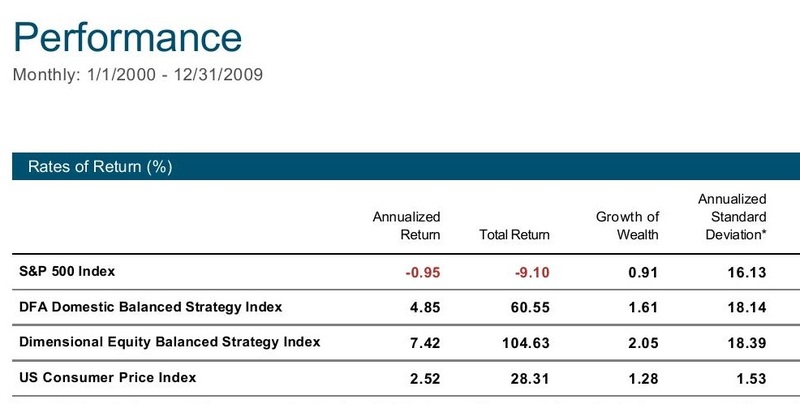 The DFA Equity Balanced Strategy Index generated much higher and more consistent returns. From 1970-1979, the S&P 500 had a modest return of +5.9% per year. But after netting out inflation (CPI) of 7.4% annually, US stocks actually lost money. Diversifying globally would have made a difference. The DFA Equity Balanced Strategy Index returned +13.4% per year, a full 6% ahead of inflation compared to -1.5% real returns for the S&P 500 (the DFA Domestic Balanced Strategy Index returned +10.1%). After two stellar decades for US stocks, 2000-2009 saw another 10-year period of dismal domestic stock returns. This time the S&P 500 was negative on a nominal basis, losing -1.0% per year. Inflation was relatively mild, increasing only 2.5% per year, but this still pushed US stock returns down to -3.5% per year for the entire decade. Once again, diversifying globally helped out. The DFA Equity Balanced Strategy Index gained +7.4% per year, almost 5% ahead of inflation and an even better result relative to the S&P 500 than in the 1970-1979 period (the DFA Domestic Balanced Strategy Index returned +4.9% from 2000-2009). It can be difficult to stay disciplined with a globally diversified portfolio during long stretches where US stocks outperform. We saw this in the 1990s and are again witnessing this in the 2010s. But the long-term evidence finds that globally diversified asset class portfolios have generated superior risk-adjusted returns to US-only allocations, and global diversification proves most beneficial when it’s needed most (when US stocks underperform). Instead of trying to time leadership changes between US and non-US stocks, you’re better off developing a globally diversified portfolio and rebalancing periodically when one region performs significantly different from the others. You might not always have the best returns, but you’ll most likely avoid having the absolute worst, which makes accomplishing your goals a lot easier and more reliable.